TEAM OF HOPE: (From left) Project R.A.R.E. 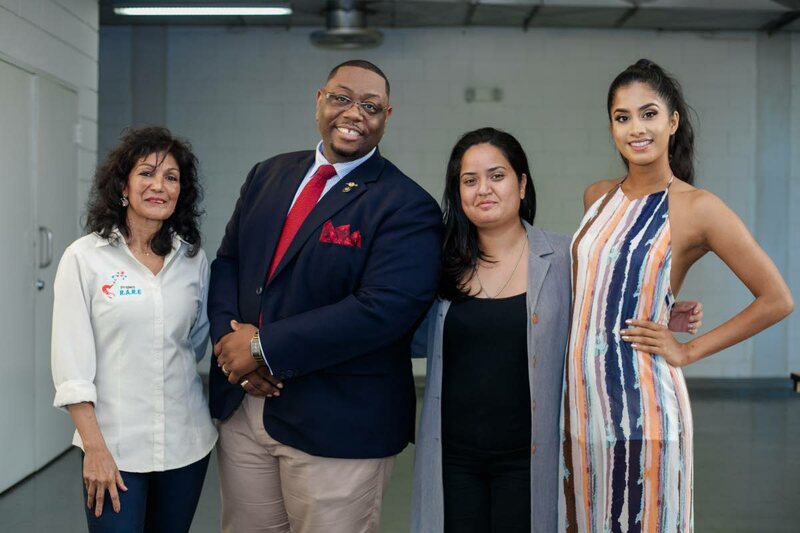 founder Caron Asgarali, clinical traumatologist and Children's Authority chairman Haniff Benjamin, #NotOkay founder Candice Alaska and Miss World TT 2018 Ysabel Bisnath. LAST year, when Candice Alaska hid for her life in a bathroom stall after witnessing a man being murdered, she accepted she was about to be killed as well. Alaska, founder of the #NotOkay non-profit organisation, shared her story at the launch of the Invisible Scars...PTSD Examined campaign on Sunday at the University of Trinidad and Tobago's O'Meara Campus. She recalled witnessing a murder last year while at a cafe in East Trinidad. "It was out...and I was editing on my laptop – basically half of my life is video editing – and the place I was in, some men walked in and started carrying on and arguing and getting on, I don't know about what. But they were just arguing and making a big scene. "And a few minutes later they started shooting. And the result of that shooting was that they murdered somebody in cold blood a few feet away from me." Alaska said she and a group of strangers fled for their lives. "So we had nowhere to go. There was nowhere to run. There was nowhere to escape. There was no other exit. There was nowhere really to hide. So something about that, being trapped in this space and waiting for whatever was going to happen to you and having nowhere to go, that had a terrifying 'charm' of its own." She said she and the other people ran into the bathroom, which had no locks. "There was nothing protecting us from anybody who wants to come in and murder us. And I waited there for what seemed like a very, very long time. And I had accepted that night that I was going to be murdered." She said despite being in a "nightmare situation coming to life" afterwards she was okay. "Some people told me, 'I find you handling this so well,' and, 'If it was me, I would be in a mess.' And I was like, 'Yes, it happened but it is in the past and I'm fine.'" She said a lot of people all around the country were losing loved ones or witnessing shooting and murders and horrendous things and were fine. But she said that felt fine and she moved on. But a few months later, while dropping home the sibling of a friend, she became stuck in bumper-to-bumper traffic on a road with one way in and one way out. While waiting, Alaska saw a group of drunk men quarrelling at a nearby bar. She became and irritated and began gripping the steering the steering wheel. "I realised something was very wrong with me." It was only months later, however, she realised she had been having an anxiety attack. Alaska said some people believe trauma is not something that has to be dealt with and was just a normal part of life. or was something people push down emotionally. She said she strongly believes in education and awareness of mental health, and that a lack of awareness was causing people to suffer a lot more. For more information on the campaign, you can search for #NotOkay on Instagram and Facebook. Reply to "‘I accepted I was going to be murdered’"